1) See the recent article in The Villages Sun reagarding our clud! 2) For those of our Cavaliers that are on heart medicine, Vetmedin, the availability has been inconsistent. Right now 1800petmeds.com (800-738-6337) has it available 5.0 mg in 50ct for $85 with a prescription. The normal dosage is 2.5 mg in the morning and in the evening. The 5.0 mg is easy to break. 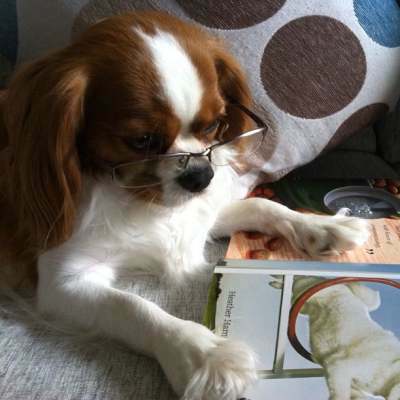 We are Residents of The Villages, Florida,USA, who own pure-bred Cavalier King Charles Spaniels who are excited to make new friends,learn and share information about the breed and provided socialization for our beloved Fur-Babies. We strive to be a physical presence in the community, whether by particiapating in parades, social outings in The Villages or nearby, therapy dog work, reading programs, educational events or participating in rescue. Basic social fun will help to strengthen and grow our club in the community. Located at NW corner of Bailey Trail & Buena Vista Blvd. Meeting Second Sunday of the Month from 4.30 pm to 6.50 pm. Meeting in Craft Room. IMPORTANT Enter through the club room door located on the north side off of the parking lot. PLEASE DO NOT BRING YOUR CAVALIER through the lobby. We have guest speakers who help us understand the health of the Cavalier King Charles Spaniel through lectures by veterinarians, cardiologists, the AKC local clubs, breeders, Cavalier Rescue of Florida, pet store owners, trainers and nutrition experts. Go to the Membership section of the website and download form. We look forward to meeting you and your fur-babies.